What do we know about the King falcons? What will we see in the next few weeks? 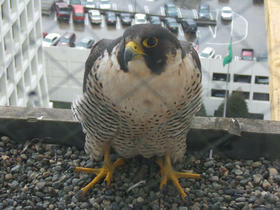 Peregrine falcons are now surprisingly common in urban areas. A nest is just a perch on a high cliff ledge, preferably south-facing, with an overhang. Tall buildings and bridges with similar ledges are favorite sites, too. In 1989, a Northern States Power (now Xcel Energy) employee spotted a peregrine falcon hanging out around the stack of the Allen S. King plant in Oak Park Heights, Minnesota. The company installed a nest box, which quickly became home to a falcon named Mae. The nest box was a success, and the power company decided to provide nest boxes at nearly all of its Minnesota power plants. This year, the King plant nest box is home to a female falcon named Belinda and a male named Brent. This is Belinda's eighth season at the King plant; two of her five eggs hatched early on Tuesday, May 24. Want to see what they're doing right now? If you're in the Museum's Mississippi River Gallery, you can watch the falcons on the live feed. Otherwise, click here. (If that doesn't load, try here. )From the first link, you can also check out still pictures of the nest box over the last 24 hours.